LANGUAGE AWARENESS: Where did we get the words for colours? Write a page for your Language Portfolio about what you notice. Be a Language Detective - you are beginning to find out the importance of language and how we use it in our lives! We made a table of the words for colours in different world languages. You could make a display of the words for colours in as many different countries and languages as you can find. The Freelang.com website will be useful in your research. As part of their work on "colours", one class decided to look at the French artist Henri Matisse, who was born in a hard-working town in what was then grey, flat Northern France. As an adult. Matisse escaped to lively Paris and warm Nice in the South of France - where he did most of his work. He retained affection for his childhood roots, and gave a big collection to found a museum in his home town of Le Cateau Cambrésis. The class found that, even in his lifetime, Henri Matisse (1869 - 1954) was counted as one of the greatest modern artists. The children learned that he is known for his use of rich, bright colours, fanciful patterns, flattened abstract forms, and graceful lines. They enjoyed this web site based on an American collection of Matisse's work - in Baltimore. "I have worked all my life before the same objects. The object is an actor. A good actor can have a part in ten different plays; an object can play a role in ten different pictures"
Children enjoyed spotting which prop appears in both "Interior With Dog" (1934) and another painting in the Baltimore Collection. On other pages, they looked for patterns, and found out how Matisse represented real objects and people. As he grew old, Matisse became too ill to paint, but he explored making "cut-outs" instead, and produced some of his greatest works - like "The Snail", created in 1953, a year before he died. The class found out more on the Tate Modern website, which showed how took sheets of paper, and had them painted by assistants in the colours he needed. Then he cut of tore them into shapes, and directed the assistants to arrange them pinned up on a large canvas on a wall. See the Web Museum for a biography of Matisse and a collection of images. 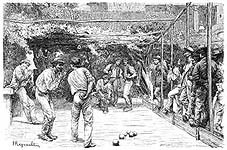 Playing boules in France in the 19th century: the Pétanque version was devised in 1910 in the south of France. We suggest you start pupils playing the very simple game of "beach boules", where they play as individuals. This is played with coloured balls, and gives opportunities to talk about colours. 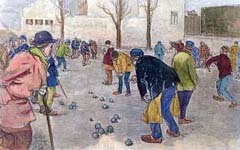 Later, in section 9 (Numbers 13-31), we look at pétanque as a team game, which brings in counting and measuring. With section 9, there is a single-sheet summary of the rules of the team game, which you can give out to pupils. Schools can affiliate to the BPA and get help with running competitions, coaching, and access to local Petanque clubs, They also run an award scheme with four levels to help encourage young people to develop their ability and skill at the game. 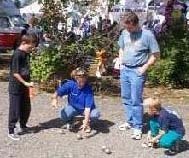 Pétanque / boules is a game for all ages. Building a playing area: a "piste" or terrain. http://www.beachmedia.com - lots of useful information from a US enthusiast.